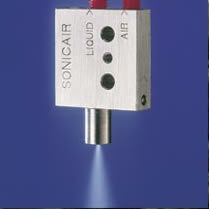 IVEK’s Sonicair nozzle is a precision-machined atomizing nozzle constructed from 316 Stainless Steel. There are no moving parts or valves that can compromise the effectiveness of the spray. The design’s unique high-pressure zone created at the liquid/air interface results in substantially reduced residual atomization after fluid delivery and enhanced performance. This contrasts to typical nozzles that use a venturi principle (low pressure zone at the liquid/air interface). In operation, the Sonicair uses constant airflow with pulsed fluid delivery for dispensing applications. High repeatability in both droplet size and spray pattern (conical) is achieved when combined with our positive displacement fluid delivery systems. The Sonicair provides accurate, repeatable and reliable atomization of fluid viscosities up to 100,000cps. Typical applications include silicone atomization for needle and barrel syringe lubrication, solvent-based fluid atomization, drug coating for medical devices and industrial applications requiring high-resolution spraying. The Sonicair can be combined with any IVEK fluid delivery system so atomizing profiles can be adjusted or set specifically for any given requirement.